“Imagine what the South Pacific would be like in five or six years’ time if there were 50,000 resettled refugees in PNG, and perhaps 10,000 in Vanuatu, 5000 in Solomon Islands and a few thousands elsewhere in the Pacific. These refugees would be Iranians, Iraqis, Afghans, Pakistanis, Palestinians, perhaps some Sudanese and Somalis, and most of them getting some Australian financial support. This population would constitute a recipe for social instability and a significant security problem for the region”. The Australian Prime Minister, Kevin Rudd, is utterly shameless. Having opened the floodgates to up to 50-thousand asylum seekers arriving in Australia by boat, he now seeks to dump them in Papua New Guinea and other Melanesian countries to save the Australian Labor Party’s skin in the coming election. The potential consequences for the member countries of the Melanesian Spearhead Group are extraordinarily grave, as The Australian’s Foreign Editor, Greg Sheridan, outlines in the article republished below. It’s high time for the Melanesian countries – led by Fiji – to stand up to this outrage. Because if it proceeds, it’s no exaggeration to say that the region will never be the same again. KEVIN Rudd’s Papua New Guinea solution is a giant bluff, which nonetheless does have a small chance of working and is therefore well worth a try. But let’s be clear. The risks are enormous. The PNG Solution can only work if it’s implemented ruthlessly. But equally it can only work if it’s only implemented a little bit. Tony Abbott is entirely entitled to point out Rudd’s lack of credibility on this issue, point equally to the many holes and unexplained features of the scheme and to say it probably won’t work. For Rudd to say this encourages people-smugglers is ridiculous. It is not a few words by Abbott but the cumulative record of the Rudd and Gillard governments that has destroyed Australia’s credibility. 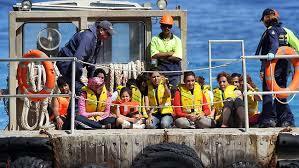 Since Rudd abandoned John Howard’s policies in 2008, nearly 50,000 illegal arrivals have come by boat. That’s your credibility problem. However, Abbott is not entitled to criticise PNG itself, to demonise the idea of sending asylum-seekers there, or to demonise even resettlement in PNG. Up to now, I would say the opposition has not crossed the line, but it’s come close. To have any chance of success, the PNG Solution must convince people-smugglers and their clients they won’t get permanently to Australia. The Rudd and Gillard governments have made words as cheap as chips in this area. Only actions count. Abbott is right to say the scheme has no credibility until people are transported to PNG. However, if the program is implemented for more than a short time it’s going to create an entirely new security problem for us. That will be the creation of a disgruntled, new Muslim population in the South Pacific. Australia will seek a multi-nation scheme. Canberra would hope it has a chance of getting either the Philippines, Thailand or Indonesia, or some combination of them, to set up processing centres financed by Australia. This would be difficult, but not impossible. But none of those nations would accept the idea of permanent resettlement. The only nations that could conceivably accept that are South Pacific nations. Australia could make the balance of such deals so attractive that South Pacific governments might accept them. But imagine what the South Pacific would be like in five or six years’ time if there were 50,000 resettled refugees in PNG, and perhaps 10,000 in Vanuatu, 5000 in Solomon Islands and a few thousands elsewhere in the Pacific. But the risks are greater even than that. If we get half way into implementing the solution and it doesn’t work at all, we will have completely destroyed the credibility not just of the Rudd government, but of Australia more generally, within the region, and with people-smugglers. Securing regional co-operation would then be much harder, so would deterring, or bluffing, the people-smugglers. I sincerely hope the Rudd government is not making a cynical calculation that the obligatory court action will render the PNG Solution null and void, but do so after the election, so that, if re-elected, it can spend three years blaming the courts, or the opposition’s legislative recalcitrance, for ongoing failure. Surely that’s not in anybody’s mind. One way of pre-empting that is for a vigorous, rapid flow of the hundreds of people who have already arrived since Rudd’s judgment to PNG. It can’t happen in 48 hours, but it should happen very, very fast. As it reviews its options for toughening up our refugee assessment process, the government is finding that any really effective action requires legislation. No matter who wins this election, the Australian government must legislate in this area. It needs to remove the right of appeals to the courts, to provide for one initial decision and one layer of administrative review and nothing more. It must tightly define what the provisions of the refugee convention mean in Australian law. The refugee convention is no longer a reasonable mechanism for determining refugee issues. It does not produce equity, justice or an ability for nations such as Australia to reasonably pursue the national interest. Its formal obligations are few, but activist courts have tended to accept the wildly expansive interpretations of the convention placed on it by the UN High Commissioner for Refugees. The UNHCR does good work in the field, but is a disastrous policy body. The refugee convention has been incorporated into Australian law partly by direct legislation and partly by activist judicial interpretation. Probably the policy ideal would be to withdraw from the convention and work out our own laws reflecting our own adherence to universal values of human rights and our own national interests. We would get a better result out of this than we get from law by judges. However, this proposal is too radical, at least at the moment, although it would be salutary for the UNHCR to contemplate life without Australia’s money and without Australia’s generous provision of permanent resettlement places. The whole question of who is a refugee is immensely complex and involves a thousand shades of grey. Some people definitely are, most coming to Australia in my view are not, and there is a big grey area. Even for those who are refugees there is no reasonable human rights claim that they can self select to live permanently in Australia. We should be generous in our refugee intake, but its composition should not be determined by people-smugglers. Many who come now are economic migrants rather than refugees, as Bob Carr has argued. A better legislative initiative would be to pass explanatory legislation saying exactly how we interpret the refugee convention and placing explicit limits on that interpretation so that these decisions are rightfully made by parliament and government, influenced by our own debate, and not by courts that, conscientious as they are, are as easily fooled in this area of constant deception as anyone else. Gillard would have been better to present such legislation and have it defeated, thus making the argument crystal clear to the electorate. Abbott will need such legislation if he is prime minister. Now that MSG countries don’t need visas to travel to each others country, it is easy to imagine these 50,000 or migrants jumping on a plane and all moving to Fiji because it is more secure and developed etc. Australia is destabilising the whole region for cheap political gain by the Labor party. Am glad that Bainimarama has spoken out. More regional leaders need to do so, instead of being cynically bought out by Australia. Damn true but on the topic of Abbot he was in Govt when his boss Howard came up with the Manus Island solution, now that Labour has “IMPROVED” on it he doesnt’ like it. Abbots solution is now a an armed forces one with a new Commander etc-one would think Australia was getting invaded, well in a way they are since Abbots tuwa also came by boat! Unfortunately, the balance in Australia has shifted once again in favour of labour. Chances are that Rudd can scheme his way to an election win. And we know what this will mean: Disrespect for our government in Fiji, disrespect for our sovereignty and first and foremost a non-acceptance of the election results in Fiji which will confirm the rule of our AG and our PM. Rudd’s ganging up with PNG’s O’Neill is clearly an attempt to undermine the Melanesian brotherhood, to divide and conquer. Next thing he will bribe Vanuatu and the Solomon Islands and there is a serious risk that Fiji will completely isolated in the region. So what can be done about this very unfavourable developments? Quite simply, Tony Abbott has to win the election. He could learn a lot from the tactics of our leaders here: They have managed to convince the electorate through decisive action, through full transparency and through full accountability. Rudd is really showing up the reality of the so-called MSG solidarity..each one of them (viz PNG, Solomons & Vanuatu) have their price! All this idea of solidarity etc is of face-value only. When offerred huge sums of money, countries like PNG, Solomons & PNG will buckle under the temptation…and take the dollar! They are extremely malleable in the face of the Aussie $. Thats what Frank has not been able to accept i.e. the fact that each of these Melanesian countries can be bought out by the strength of the lure of Aussie $$$…their governments don’t really care about this MSG bull dust…at the end of the day…if you dangle sufficient paisa $$$ in front of them, they will baulk.! Rudd has just shown up the reality of MSG solidarity…..Frank cannot match the power of the Aussie $….it can be used to undermine Frank’s intentions and grand plans for MSG solidarity. Ya, the power of the Aussie dollar is now being used to divide and rule the South Pacific in Australia’s national interests. Colonialism is still alive and well in the Pacific. Now the Aussies shift their problem to Melanesia. I believe our current Fiji Govt is monitoring the situation very closely and will find a solution to ensure that the effects of this will be in Melanesia’s favor. I pray that our good Lord will prepare a path for Fiji to help our Melanesia brothers out of this difficult one. Perhaps diplomacy and respect is the best approach to handling this difficult political and sensitive problem with our Melanesia brothers. May God bless and guide you always. Can we trade off some Labasans in Samabula/Suva for some refugees!! say 2 to 1. Send 2 Labasans to PNG and receive 1 refugee. We can then let that one refugee “marry” another and the rest be their siblings. We will provide papers. We can then send this afghani/Iraqi refugee and his “family” via our diplomatic mission ( as a staff..maybe) to Australia and let them “disappear”. And replace this fella with another refugee diplomat “family” …and so on. And lo…we will get rid of all Labasans from Suva to PNG and all refugees back to Australia…. And tell Rudd…aha…. we beat you at your game…..we know you can speak mandarine but we Fijians will make you eat lemon with your earwax. Why can’t we send people who are everyday posting on blogs about Bainimarama Government. Since they are not happy under this government, they should be sent away to live in another country – Rajen Chaudhary has already taken ‘refuge; status in NSW. Let his and John Samisaoni’s thinking type of people march out. The rest of us can live in peace. And they did it through bribery instead of proper consultations since they really are considering desperate measures for their own interests. Can clearly tell that the Fiji-led MSG is not going down without a fight.